Get Visual Studio Online news and updates inside Visual Studio. 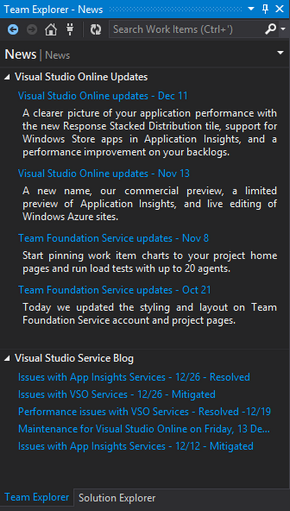 View Visual Studio Online updates and news from within Visual Studio. If you are a Visual Studio Online user you are defintely following theVisual Studio Online News& the Visual Studio Online Status Blog. As developers we hate to leave Visual Studio to look these blogs up and if you too are itchy about this our 'News' extension comes to rescue. This extension is our first attempt at bringing blog content to within Visual Studio, we are learning & would appreciate your feedback. if you find any bugs, please report back to us, we'll sincerly try our best to unblock you at the earliest. 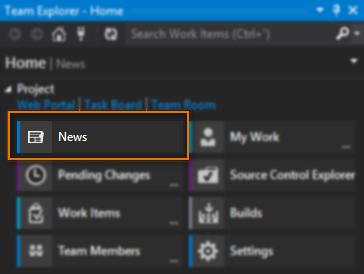 News is a Visual Studio extension that brings the blog content to you right within Visual Studio and let's you surf this with the visual studio browser. In the image on the right you can see each blog is loaded with a title & a brief description. Clicking the hyperlink loads the full blog post in a browser hosted with in your Visual Studio. We currently only support Visual Studio 2013. You are required to be connected to Visual Studio Online in order to use this extension. Note - This extension will not show up in Team Explorer if you are disconnected from TFS. If you like this extension, please share and tweet... We want your feedback!